THE GLEDHILL FAMILY OF LINDLEY AND THEIR BUILDINGS. 27 February 1798 is a significant date in Lindley's history for on that day an award1 was drawn up which divided and allotted the open, or common, fields of the village to the fourteen individuals who then held land within them. The award also set out the line of new highways amid the allotments, to the south of the then village, along which development soon followed. This article is concerned with an allotment made to Thomas Firth of Lindley, cornfactor, a Quaker. The land which lay adjacent to existing crofts, or enclosed holdings, at the southern extremity of Lidgate (Lidget) Lane was known as Croft End. In February 1800 Thomas Firth sold 272 square yards of the allotment to Joseph Gledhill2, a blacksmith, who is first noted in the village in 1791 when a son, Freeman, was baptised at Salendine Nook Baptist Chapel3; his first son, Martin, had been baptised in 1789 when the family were stated to have been of Hill Top4. Freeman must have died for six years later Joseph and his wife baptised a "second Freeman", they also called one of their daughters Freemy. There was clearly an attachment to this name, probably through some family connection for it was also used in the family of his in-laws. The Baptist connection may have come with his marriage5 in 1788 to Elizabeth Morton, one of a family who were instrumental in founding the chapel at Salendine Nook. 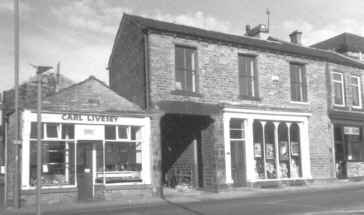 Having purchased the land in Lindley Joseph proceeded to erect on it a cottage and a blacksmith's shop. The central building of this early development upon the old open fields, which incorporates a most interesting date-stone, still stands. 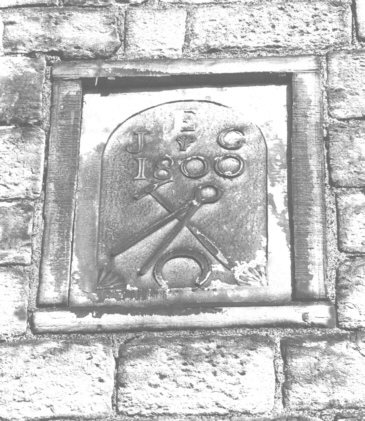 The stone bears the initials E J G, for Elizabeth and Joseph Gledhill, and the date of the building, 1800, over motifs of the blacksmith's trade: hammer, tongs and horseshoe. A development of the following year which also resulted from the enclosure of Lindley Town fields was the property Daisy Lea, built by Thomas Hirst who lived at Beggar Style or Croft House as it became known. Joseph Gledhill's property lies at the heart of the present village, in the yard beside Carl Livesey's butcher's shop, hidden from view by a subsequent development of the Gledhill family. Established on his own freehold, Joseph apparently prospered, for he continued to expand the holding. In 1814 he purchased6 a further 108 square yards of the allotment from Thomas Firth, for £l3. 13s. 0d. upon which he built two more cottages and another blacksmith's shop. By that time his two sons would have joined him in his trade, Martin had married and given him a grandson7, Gideon, and his other son, Freeman, was seventeen. When Joseph died some ten years later Freeman, who in 1824 had married Maria Morton8, had removed to Outlane, and Martin succeeded to the business. Martin appears to have been dead by 1841 when the census shows Gideon Gledhill, blacksmith, living in Temple Street, and with him Calvin Gledhill, blacksmith, and Joseph Martin, blacksmith's apprentice. In that year there were four families living at Croft End, the head of one being yet another blacksmith, William North. Smithies which could occupy three blacksmiths must have been a centre of village life on working days with carriers, farmers and tradesmen calling to have their horses shod or their implements repaired, and we may imagine that Lidget Street was not often free of the ringing of hammer on anvil. Martin had left his real estate to Gideon9, but a small rent charge was secured to his widow, Elizabeth, who removed to Dewsbury, and when Gideon wished to borrow money upon the estate he had to make a settlement with his step-mother to release her interest. Gideon was a member of the established church and was for many years the organist and choirmaster of St. Stephen's, Lindley Parish Church, where he is commemorated on a tablet within the church, and buried along with other members of his family. By the 1850s the area to the north of Temple Street which comprised the Gledhill freehold had become known, appropriately, as Smithy Fold, and at the end of the decade Gideon redeveloped the eastern side of the estate, erecting a modern two-storey building on which his initials and the date 1859 may still be seen. The new block (shown here), which dwarfed and hid from view the original building which his grandfather had erected, may have marked a transition from the traditional trade of blacksmith to a retailer, for the ground floor of the premises comprised two shops fronting onto Lidget Street, and Gideon and his successors are noted from 1867 not as blacksmiths but as ironmongers. In 1870, the year before his death, Gideon was described10 as an ironmonger and machine maker and it appears that the different facets of his business were then split. In 1873 two of his sons, John, the eldest, and Edwin Gledhill were recorded as crane and machine manufacturers and the ironmongery was being conducted by the executors of Gideon Gledhill11, probably on behalf of his son Stephen Wilkinson Gledhill, then under age, who is shown as the proprietor from 1879. The family were no longer noted as blacksmiths, but George Dyson who is recorded as a blacksmith in directories of the 1870s was Gideon's cousin, another grandson of Joseph and Elizabeth Gledhill. The new premises which John and Edwin erected for the manufacture of cranes and machinery are now part of the concerns of a major insurance broke., lying to the south of Temple Street, and their erection is commemorated in a key-stone inscribed J & E G 1878. As with many industrialists of the period the two partners made their homes close to their business. John who died in 1940 at the age of 95 lived at 5 Temple Street, a substantial double-fronted house the back of which looks onto the works, and Edwin also lived in Temple Street. The business continued in St. Stephen's Ironworks, as the building was known, down to 1937. The photograph of the date stone courtesy of Huddersfield Examiner. 1 West Riding Registry of Deeds, Wakefield, B 24 339. 3 Registers of Salendine Nook Baptist Chapel (microfilm), Huddersfield Public Library, Local History Section. 5 Parish Registers of St Peter's, Huddersfield (microfilm), Huddersfield Public Library, Local History Section. 6 West Yorkshire Archives, Kirklees, KC165-109. 9 West Riding Registry of Deeds, Wakefield, OT 138 121.